Sheffield Renewables have delivered their third community owned renewable energy scheme, a 50kW solar array panel at Attercliffe police station. This project is part of wider efforts by South Yorkshire Police to increase its sustainability, which will also help to reduce energy costs. A locally based community share offer, sourced through Sheffield Renewables, paid for the panel which cost £61,500, and Attercliffe Police Station will now benefit from a 20% reduction on their energy bills and an annual saving of 16.5 tonnes of CO₂. “It is important that we all do our bit to reduce the carbon footprint. 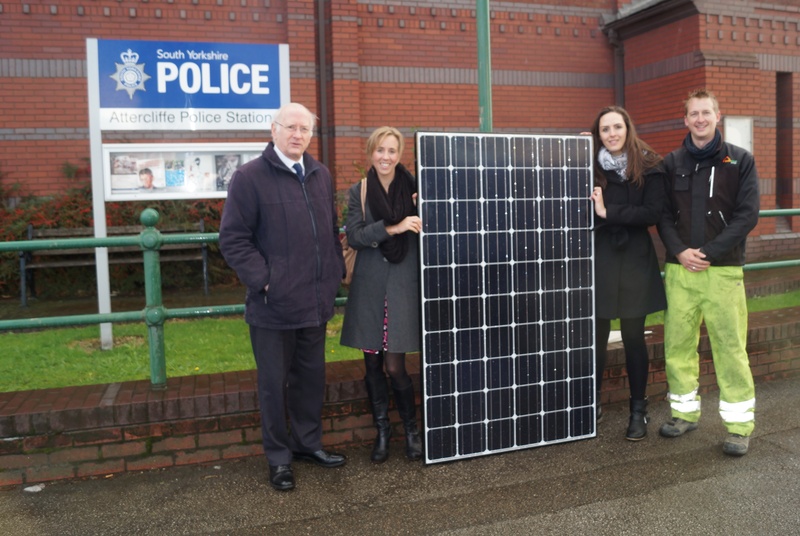 South Yorkshire Police have now moved to providing sustainable energy at a number of its police stations, which is going a long way to reducing the Force’s overall carbon footprint. Sheffield Renewables are working towards developing 500 kW of renewable energy in the Sheffield City Region over the next 5 years. Work has started to identify more suitable sites. Proposals by the current Government to scrap renewable energy subsidies will make this more challenging, but Sheffield Renewables are committed to exploring new ways of funding schemes. In the mean time they are assisting in the fight to save these subsidies. Sheffield Renewables response to the FiT consultation results	Taking from renewable energy to give to ‘diesel farms’? !